Time flies when you’re having fun… Can it really be a year since my last visit to BBC Gardeners’ World Live and BBC Good Food Show Summer? Well, it’s nearly time for one of the summer’s biggest days out to return to Birmingham. Next month, BBC Gardeners’ World Live and BBC Good Food Show Summer will take over the NEC in Birmingham for four days of culinary and horticultural fun. Over 500 exhibitors will be at the show from Thursday 14th June to Sunday 17 June 2018, and one ticket gets you into both spectacular events. Of course, firm favourite and Gardeners’ World lead presenter Monty Don will be at the show. He will be joined at the show by co-presenters including Carol Klein, Adam Frost, Mark Lane and Arit Anderson. And if you are visiting on Friday, you will also be able to see gardening legend Alan Titchmarsh. As always, you’ll be able to see inspirational Show Gardens at the show, including the Made in Birmingham garden. This will feature a railway embankment plot with allotment, wildflower meadow and a working steam engine. The Wyevale Garden Centres Solutions Garden will have tips and advice to deal with common issues such as soil types or shady areas. And the Beautiful Borders will be full of gardening ideas for small spaces. Plus the Tesco Every Little Helps Garden will be offering ideas for small changes that can make a big difference. And if you’re feeling inspired after all that, the Floral Marquee and Plant Village are heaven for plant lovers. You’ll find over 100 dedicated places to buy quality plants, seeds and bulbs. I’ll be covering both the Show Gardens and the Floral Marquee here on the blog after the show. 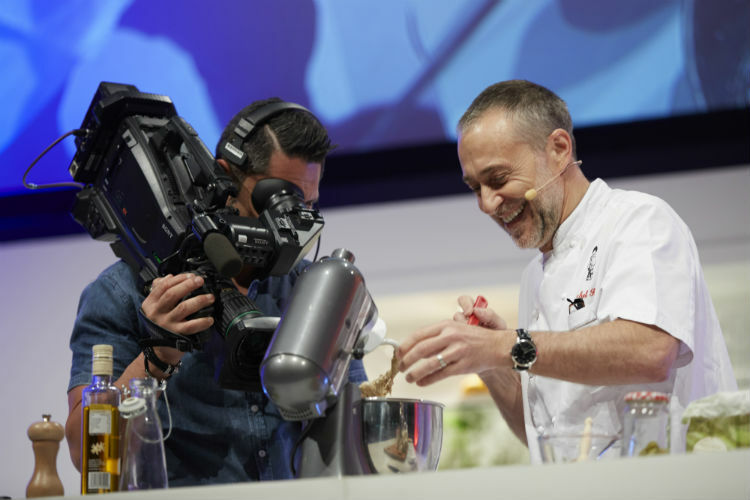 You can see all your favourites like Mary Berry, James Martin, Tom Kerridge, and Michel Roux Jr at the show. They will be cooking up a storm on stage in the Big Kitchen, and there will be plenty more chances to see them around the Show. This year’s show also features the new Eat Well zone. This will showcase the best in vegan and vegetarian products, with expert advice and recipe ideas at the Show’s Summer Kitchen stage. And there are masses of opportunities for shopping including the Producers’ Village and the Drinks Emporium. You really will be spoiled for choice! You’ll find the best in cooking and gardening inspiration at this show. Stages around the NEC will be showcasing a full mix of plot to plate inspiration, live demos, Q&A’s, talks and plenty of advice. Plus, there’s the chance to chat to more artisan producers and gardening experts than you can fit into one day. Ticket holders gain entry to both Shows, with children under five going free. Discounts and free tickets available for groups of eight or more. Or an extra special treat, why not take a look at the VIP and VIP Luxe packages. These include front row seats in the Big Kitchen super theatre and BBC Gardeners’ World Live Theatre. You’ll also get access to exclusive lounges and much more. Yes, three lucky winners will receive a pair of tickets to the BBC Gardeners’ World Live and the BBC Good Food Show Summer. And for a chance to win, all you have to do is to log into the Rafflecopter below and answer the easy question. There are additional social media entries that you can use to boost your chances of winning. The giveaway will close at 11.59PM on Wednesday 6th June 2018 and is open to UK entrants only. Because the show starts on 14th June, winners will be picked at 9am on Thursday 7th June 2018 and must get in touch by 9am on Friday 8th June 2018. If they have not made contact by that time, new winners will be picked. The event runs from 14-17 June 2018, at the NEC Birmingham. Only valid on Thursday, Friday or Sunday; no Saturday admission. Prize includes 2x entry passes – no travel, expenses or accommodation is provided. General admission tickets do not include theatre seats, but can be purchased on the day, subject to availability. Not all celebrities appear on all days. Contact information will be supplied to third party who will post your winning tickets directly to your home address. The prize is for three pairs of general admission tickets, so there will be three winners. Prize cannot be swapped for cash or sold on. What will you be looking forward to seeing at the BBC Gardeners’ World Live and the BBC Good Food Show Summer? Love the Good Food Show! A great day out for everyone. I would like to see the designer garden displays plus have the opportunity to buy plants and ask for advice on keeping them alive! The gardens and the food, sustinace for body and mind……. We’ll be looking forward to being inspired by the demos. I would love to go to the BBC Gardeners World Live and BBC Good Food Summer Show. My bestie Alli and I love a good day out it will be brilliant. Loads of cookery shows and loads of tasters too. As I have never been, I would just love to see it all. i have very recently changed to a GF diet, so I would be interested in tasting GF food. so excited to see Mary berry! Seeing Mary Berry in the Kitchen would be amazing! all the fantastic new gardening ideas, i’m especially looking for water gardening ideas! I look forward to seeing the show gardens which are usually stunning! I am looking forward to the show gardens and learning new ideas. I would love to go as I’ve fallen in love with plants since buying out first home so would be going to find inspiration. Love the Good Food Show. I enjoy trying all the beers & ciders! Lovely! Tom Kerridge – love his recipes. The hydrangeas and the Acers. Just love them and always end up buying something that is heavy to carry back to the car. I always love to try new food and I am also looking for a cute little cactus. All the new trends in food & gardens. I’d like to see some of the celebrity Chefs and get some cookbooks signed. I want to get some ideas for my new house’s yard, which has nothing growing in it right now- just concrete and a deck and shed. I will be looking forward to seeing the live food demos. Great prize by the way! Love to see the live demos! I am looking forward to watching the chefs cooking to see if I can pick up any hints for my kitchen. All the garden displays so I can get some inspiration. Ideas for the home and garden! At bbc gardeners world I will be looking forward to seing beautiful flowers Including ones I’ve never seen before and getting away from it all and seing new products for garden. At bbc good few show I’m looking forward to trying samples and seeing what new foods are out there. At bbc gardeners world I will be looking forward to viewing all beautiful plants and at bbc good food show i will be looking forward to tasting good food. At bbc gardeners world and bbc good food show this summer I will be looking forward to seing demonstrations and new flowers and foods. The chefs of course, food tasting and shopping and there are so many lovely things to buy. I follow the smells around the hall and just enjoy taking in the atmosphere. I’m looking forward to seeing the wildflower meadow and finding inspiration to liven up the mud patch that is my garden!